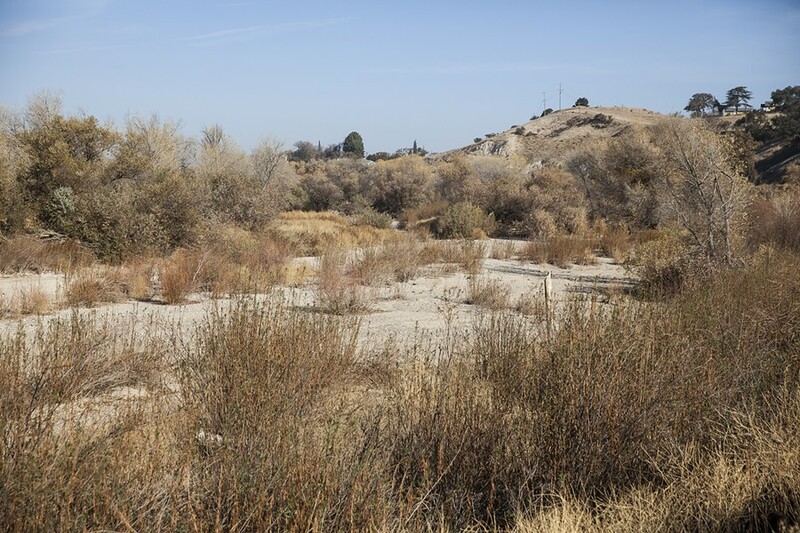 The Salinas Riverbed in Paso Robles looks a whole lot different today than it did two winters ago. In 2015, it teemed with tents, trash, and the belongings of dozens of people living there without any other shelter. Now, walking along the city's River Walk trail on a cold December morning, there's not a tent in sight. Even veering off the path—under the Highway 46 bridge or into some of the thick vegetation—doesn't lead to evidence of human habitation. NO ONE IN SIGHT Since the city of Paso Robles staged a clean-out of several homeless encampments in the Salinas Riverbed in 2016, police have routinely patrolled the area to keep it clear. According to Paso Robles Police Lt. Ty Lewis, the key difference between then and now is a "long, sustained effort" by the city to clean up the area. The effort started in March 2016, after Paso staged a comprehensive and expensive clear-out of the encampments in anticipation of heavy rainstorms. Since then, Lewis said, officers have patrolled the riverbed on ATVs (all-terrain vehicles) on a weekly basis. Between the various warning notices, citations, and even arrests issued, the Salinas River is a changed place. "Those big camps really don't exist anymore," Lt. Lewis said. 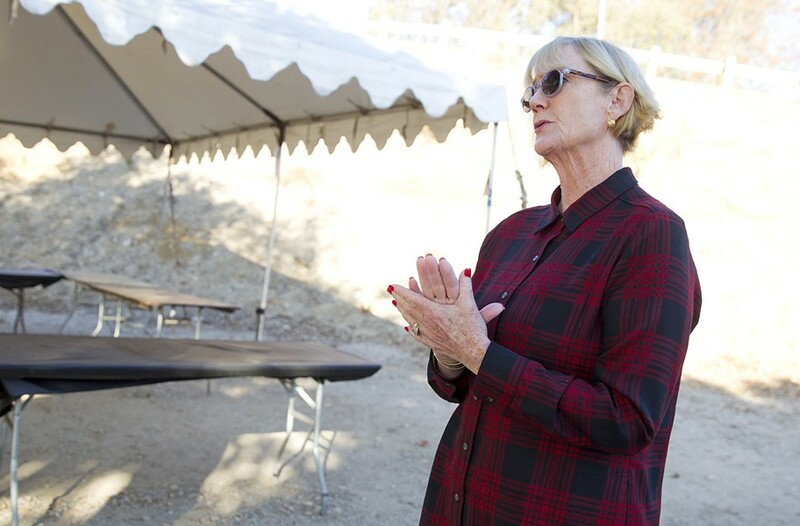 But while the Paso riverbed may be comparably clear, the campaign's done little—if anything at all—to address the underlying issue of people being homeless, local advocates say. And it's likely made the task of measuring and identifying those who are homeless in the region more challenging. County officials ran into issues recruiting "guides" in North County—or people with experience being homeless—to assist with SLO County's biennial "point-in-time" count in January, due to concerns about law enforcement's presence. Even some guides who did volunteer got cold feet on the count day and didn't show up. 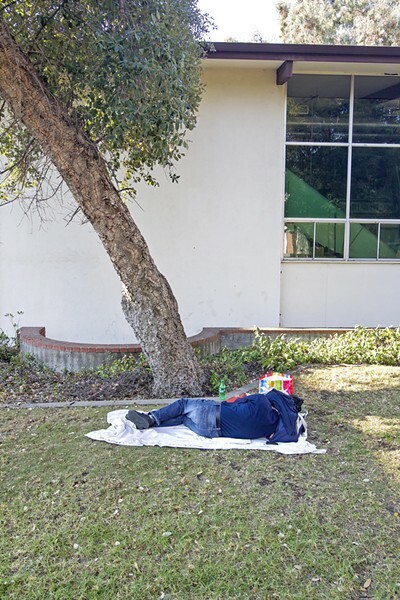 It's one of the reasons why officials and volunteers think the most recent point-in-time report showed a dramatic 60 percent decrease in the number of homeless individuals in North County since 2015. "We already know it's not accurate," said Cherie Michaelson, former president of Paso Cares, a nonprofit serving the homeless in Paso Robles. "The numbers haven't gone down." The apparent undercount raises questions about the broader narrative of this year's point-in-time report—that while homelessness across California is up 14 percent, San Luis Obispo County is making strides forward on the issue. For this story, New Times spoke with homeless advocates from around the county to try to get at the truth behind the numbers. With a 2008-adopted "10 Year Plan to End Homelessness" sunsetting next year, homelessness in SLO County may be improved, but constraints like a lack of affordable housing and declining funding for case management services continue to be barriers to progress. "Without that, we are cobbling together what we can with the resources we have," said Laurel Weir, homeless services coordinator for SLO County. According to the point-in-time count, 1,125 people were homeless across SLO County in January—390 fewer people than were counted in 2015, and 1,061 fewer than 2013. The 26 percent overall decrease since 2015 stands in contrast to spikes in homelessness found elsewhere on the Central Coast—like in Santa Cruz, San Benito, Monterey, and Santa Barbara counties. It better aligns with the modest decreases seen in small rural counties like Kern, Visalia, Kings, and Tulare. HELPING HAND Gail Oliver, a volunteer with nonprofit Paso Cares, shows New Times where it hosts the People's Kitchen in Paso Robles: a municipal parking lot. In addition to the homeless count dropping 60 percent in North County—from 629 to 253—numbers dipped 30 percent in the coast region (from Morro Bay to the Monterey County line) and 15 percent in the city of SLO. 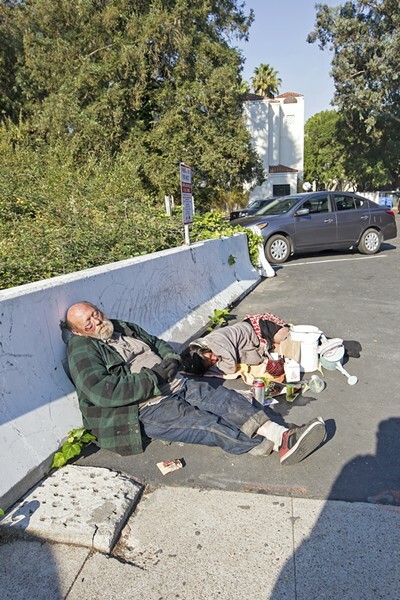 The only region of the county that saw an increase since 2015 was South County (Pismo Beach to the Santa Barbara County line), where there was a 39 percent uptick in the number of counted homeless. Of all the homeless, two-thirds were men, two-thirds were older than the age of 41, and 80 percent identified as white. Seventy-two percent said they'd been homeless for at least one year, and 34 percent reported being homeless for the first time. Point-in-time counts are required by the U.S. Department of Housing and Urban Development (HUD) to qualify for federal funding to fight homelessness. HUD sets standardized parameters for the count, like when it needs to take place, with the end goal of being able to "compare apples to apples" each year, according to Weir. For instance, the count occurs in January because the weather is usually cold or wet enough to spur the opening of emergency warming centers. That makes accounting for the homeless population more manageable. "It's easier to count somebody in a warming center than it is on the street," Weir explained. But the timing has drawbacks, like when the weather is particularly poor in communities like SLO with higher numbers of unsheltered homeless living outdoors or in cars (hovering around 70 percent of the homeless population compared to Santa Barbara's 48 percent). Weir said rain likely played a role in SLO's lower count in 2017, as it was more difficult to find individuals and some reportedly found temporary shelter that day in motels or with family and weren't counted. Despite some of the external variables influencing the count, Weir is confident that it accurately reflects another fact: that homeless service providers are managing to help get more people into housing than in the past. One of the demonstrably true areas of progress shown in the point-in-time count, Weir said, is the decrease in homeless veterans in the county. ON THE STREETS Two people sleep in a parking lot in downtown San Luis Obispo. Veteran homelessness has declined by 63 percent since 2013. Weir attributes the positive trend to an influx in federal funding starting in 2014 to tackle veteran homelessness. Local nonprofits like the Housing Authority of SLO (HASLO), Community Action Partnership of SLO (CAPSLO), Five Cities Homeless Coalition, and Good Samaritan Shelter in Santa Maria are taking advantage of new grants to fund housing vouchers and case management services for both newly homeless and chronically homeless veterans. More housing units for veterans are also coming online, with HASLO's "860 on the Wye," which opened in SLO last summer. The combined efforts are producing results, and the nonprofit groups have even created a master list of homeless or formerly homeless veterans in the county to track their progress. "There's a much more coordinated process now," Weir said. "They meet monthly to go over everybody on the master list to talk about where they're at right now." One caveat, though, is that not all veterans qualify for the services. If they enlisted after 1981, they have to have served on active duty for at least two years without a dishonorable discharge. Weir said the county's master list includes veterans who are ineligible. In those cases, the nonprofits "at least try to connect them with services they might qualify for." Another area of improvement in SLO since 2015 is with homeless families. According to the count, homeless families with children dropped down to 49 from 112 in 2015—a 56 percent decline. Weir said a state rapid re-housing program called CalWORKs, administered by the Family Care Network, has housed approximately 300 families since 2014, with an 87 percent retention rate. But as certain homeless populations get more state and federal attention, others have virtually fallen through the cracks of the system. Chronically homeless individuals who need more support in both shelter and case management are receiving fewer and fewer dollars, as the U.S. shifts toward a "housing first" services model that experts say works well—when there's an adequate housing supply. "The discussion of 'housing first' is great, if you have the housing inventory already on hand," said Janna Nichols, executive director of the Five Cities Homeless Coalition serving South County. "We don't have the housing stock." Nichols set her left hand on one end of her Grover Beach desk and her right hand on the other to better illustrate a point. RESTING A man sleeps in downtown San Luis Obispo. "I think the thing that people don't understand is the spectrum of challenges people face," Nichols said, glancing across the spectrum from one hand to the other. "Every call we get is a unique circumstance: Somebody died; somebody got divorced; we have a domestic violence situation ... somebody outlived their pension. Then there are folks who have some more severe issues." As a small nonprofit organization, Nichols and her staff have to make tough decisions about where on the homelessness spectrum to send their limited resources. "One of the things we've done that we didn't do three years ago is we're allocating more money to homelessness prevention," Nichols said. "What we've found is if we can keep somebody from being displaced, if we can work with that landlord to keep them in that unit, the cost to the family and the community is much cheaper." So if a farm or construction worker, for instance, has a job interruption and faces eviction as a result, Nichols said "the rapid re-housing money we have lets us give them one or two months of assistance and they're good to go." "As soon as a family is out of that house ... living on the street is more expensive than living in your house," she said. "You're eating out, you may be going to motels, and you're running your car. The landlord has to turn [the unit] over, he or she will rent it at a higher rate, and our rental cost has gone up again." One other area of focus for Nichols this year was the point-in-time count, which she said was important to get right after a questionable 2015 count in South County. The 39 percent increase in South County homeless in 2017 is more in line with reality, Nichols believes. "I'm not saying there was an increase in homelessness," she said. "I'm thinking we just did a better job of identifying who was here." While organizations like Five Cities Homeless Coalition are finding success in helping people on the brink of homelessness, gaps remain countywide with the chronically homeless, who need more support to sustain housing. The county's 50 Now Program wraps housing and services around 50 of the most vulnerable, chronically homeless people, and it's proven successful. "The families we need to look at next are the families who are chronically homeless," Weir said. "Rapid re-housing really isn't designed to work as well for chronically homeless people." As state and federal policy shifts to a permanent housing model, shorter-term "transitional" units that can be coupled with case management to help people find their footing are getting reclassified as permanent housing. That's creating a logjam of available shelter for the hundreds of chronically homeless in the county. Compounding that problem is that the federal funding sources for case management services are getting completely nixed and put toward housing support. CAPSLO lost all three of its South County case managers due to that cut. Even so-called emergency shelters like the El Camino Homeless Organization (ECHO) in Atascadero and Maxine Lewis Shelter in SLO are seeing longer stay times due to the tight housing market, Weir and Nichols said. "Everybody is having difficulty finding housing," Weir said. "When you have people who have middle-class incomes having a hard time, you can imagine what it's like for somebody who's only income is their SSI [Supplemental Security Income] check." Next year, SLO County will update its "10 Year Plan to End Homelessness," which was adopted in 2008. The reason for updating it is to stay eligible to receive more funding to combat homelessness. As much as $20 million in state funds earmarked to build housing for people with mental illnesses is up for grabs, but first, the county has to update the plan. 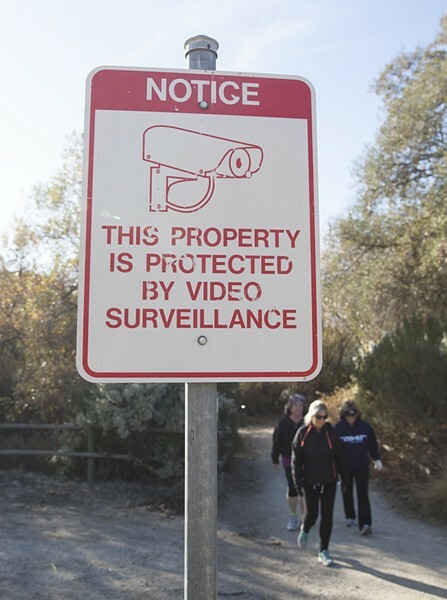 ON CAMERA A sign on the Paso Robles River Walk trail warns of surveillance cameras. Weir said the plan will likely take on a different look, because the model for homeless services vision-setting has completely changed in 10 years. It's evolved from a reliance on bird's-eye mission statements to establishing and measuring more explicit data-driven outcomes. One of the ways the state hopes to improve homeless services is to create "coordinated entry systems" where all the main organizations in an area are using the same databases and can better target services based on an individual's need. Perfecting that whole system is still a work in progress, Weir said. Any substantial progress in solving homelessness in SLO County will simply require more affordable housing, according to all the homeless advocates who spoke with New Times. Until that day comes, they say nonprofits will have to think more creatively—such as how Homeshare SLO is helping seniors find shared housing opportunities—to get folks into shelter. While the 2017 point-in-time count showed where SLO is making progress in veteran and family housing, the homeless who weren't counted, like those in North County, also told a story. In a vacant parking lot across from the Fairgrounds in Paso Robles, the Paso Cares organization puts on a nightly People's Kitchen. It's the only property the city offered to the nonprofit. A makeshift canopy is all that shields the area from the elements. On the cold and rainy nights this winter, Paso Cares will serve dinner and then shuttle the homeless from the parking lot to a handful of churches that volunteered to serve as warming centers. The organization is always seeking volunteers to help chaperone the warming center. Aside from this service, Paso Cares volunteer Gail Oliver told New Times the community can and should be doing a whole lot more.